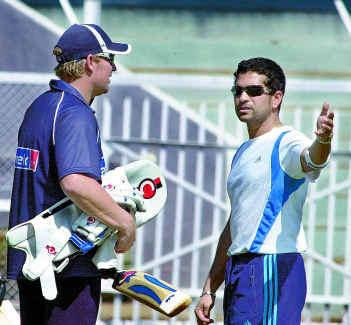 Spin legen Shane warne hailed former rival Sachin Tendulkar,saying that a batsman of his class and skill deserved to be on top of the run heap. I just think he has a class about him.The way he conducts himself on and off the filed,the pressure he's under witha billion people watching him every time he goes out to bat,the way he handles decisions,he's pure skill. Warne said - he would not forget the beating he got from little master during the Australia's tour of india in 1998, Bowling to him in mid -1990s,when i thought i was at my best and a lot australian players were at best,the way he played quick and spin bowling was just fantastic to watch.